These are small but often brightly coloured birds. They hunt through the canopy (usually Eucalypts) for insects, mainly taking psyllid bug larvae and their lerps (the sugary excretions that form the protective casing of the insect) off leaves. 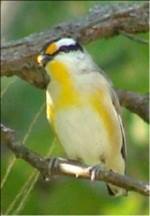 Of the 4 species of pardalote in Australia, only one is really regularly found in tropical rainforest. This is a small but striking little bird. It is cream coloured with a bright butter yellow wash on the belly, black on the cap, face and wing, and a big orange blob on the forehead. Its call is distinctive and often head; a persistent, sharp and far carrying Morse code like “pid-de-dip”. They are also found over much of Australia in a range of different habitats.